To start the drill, two cones are set up about 15-20 feet apart from each other. A coach is standing just below them with a mini-bumper (to simulate a long-body defenseman). The lines of forwards are in line with the cones, right around the blue line. F1 begins with a puck, F2 without. F1 and F2 criss-cross and execute a drop pass. F1 and F2 then proceed through the cones in a figure 8 pattern (F2 has the puck – green). F2 and F1 then execute another drop pass above the cones (F1 receives the puck – black) before taking the outside lane to attack the net 2v0. The coach times the bumper and uses it to simulate a long-body defenseman, forcing the forwards to pull up above the bumper or extend their reach and make a play behind the bumper. Ideally, F1 makes a cross-crease pass to F2 for a one touch shot. Far pad/rebound is also a play here for the forwards. 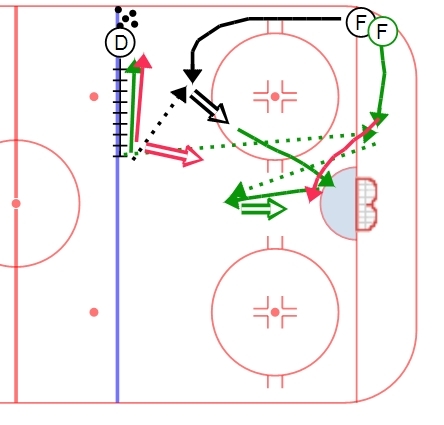 We have seen a direct translation from this drill in to games – forwards making extended reach plays and/or pulling up to make a cross crease play, both have resulted in goals off the rush.